Easy to order - easy to fit - easy to use! Horizontal windows let in 3 times more light than a vertical windows. Therefore roof windows let in a huge amount of sunlight due to the fact they are installed in roof slopes. Most of the time this brings fantastic advantages and makes for a beautiful living space bathed in natural light, but sometimes this light might not be so welcome....for example when you want the kids to stay asleep on those early summer mornings! The Loft Shop provides a fantastic range of luxury roof blinds available in 20 different colours in blackout and dimout fabric. All blinds come complete with a beautiful brushed aluminium finish frame. Should you wish to have a white or even cream frame, please call us on 020 8551 5800 and we would be happy to assist you. No matter what type of roof window you have, The Loft Shop is likely to have an affordable blind that will fit. Establishing which loft blind you require for your own window is not always the easiest of tasks which is why The Loft Shop has tried to make the process as easy and pain free as possible! Q. How do I know what blind to order?....Answer... Obtain the serial number! 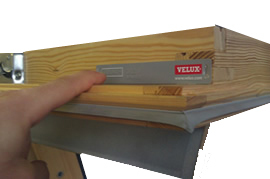 On VELUX roof windows windows the code is located once you open the window by pulling down the operation bar at the top. Once you have your serial code you are ready to go into the Blackout Blind or Roller Blind pages and order your blind! 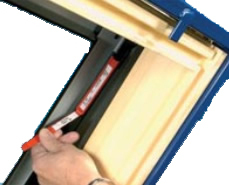 Depending how old the window is, the code for ROTO roof windows can be found in one of two different places as displayed above. 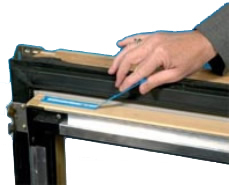 Once you have your serial code you are ready to go into the Blackout Blind or Roller Blind pages and order your blind! 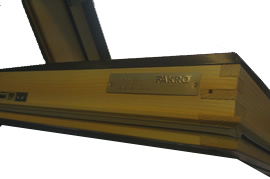 Fakro roof windows have the code placed like the Velux window, open the window from the handle at the bottom and when the top of the window comes into the room, you will find the plate located here. bOnce you have your serial code you are ready to go into the Blackout Blind or Roller Blind pages and order your blind! Rooflite/Ecolite roof windows have the code placed like the Fakro window, except on the left not the right. Open the window from the handle at the bottom and when the top of the window comes into the room, you will find the plate located here. Once you have your serial code you are ready to go into the Blackout Blind or Roller Blind pages and order your blind! 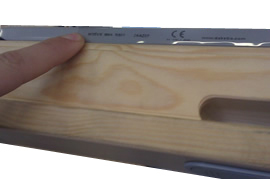 Luctis roof windows have the code placed like the Velux window, open the window from the handle at the bottom and when the top of the window comes into the room, you will find the plate located here. Once you have your serial code you are ready to go into the Blackout Blind or Roller Blind pages and order your blind!